To learn about some of Alaska’s most popular land mammals and where you might see them, click on the links below. Be sure to check back again as we continue to build the website and add more animals to the list. 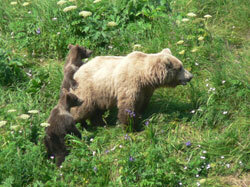 Brown bears (also known as grizzlies) and black bears are common across many areas of Alaska. They are closely related to each other and to the polar bear, which is classified as a marine mammal. A brown bear (Ursus arctos) is usually larger than a black bear (Ursus americanus), has a more prominent hump on its shoulder, less prominent ears, and longer, straighter front claws. Longer claws are useful for digging roots or excavating small burrowing animals. Black bears’ shorter claws are more efficient for climbing trees. Black bears – despite their name – can range in color from light cinnamon to blue-gray and range in weight from 200 to 500 pounds. Brown bears average between 500 and 900 pounds though some older males can reach 1,400 pounds. Both black and brown bears spend six to eight months a year feeding heavily in preparation for the lean winter months. In spring they feed on a wide variety of green vegetation, such as grasses and sedges, supplemented by moose calves and carrion. In summer and fall, bears with access to salmon streams gorge on fish. Berries – cranberry, currant, blueberry, devil’s club, and others – provide a critical carbohydrate boost. Throughout the summer, bears will dig up marmots, till meadows for roots, and tear apart logs for insects. Bears tend to be solitary animals except for females with cubs. Bear cubs are born mid-winter, tiny and blind, and nurse through the winter sharing their mother’s fat reserves through her rich milk. A female will typically have two or three cubs, and they will stay with her until heading out on their own as two-year-olds. Mother bears are fiercely protective of their cubs. 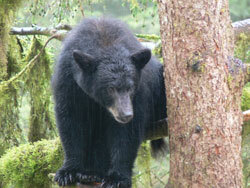 Black bears live in forests though they may be found at sea level and alpine. They are excellent climbers and can run at speeds of 25 mph. Brown bears typically live along the southern coast of the state where they feed on salmon, which allows them to grow larger and live in higher densities than the “grizzlies” in the northern and interior parts of the state. Black bears occur over most of the forested areas of the state. They are not found north of the Brooks Range or on the Yukon-Kuskokwim Delta. They are also absent from most of the Seward Peninsula and the Alaska Peninsula as well as those islands of the Gulf of Alaska and Southeast Alaska that are inhabited by brown bears. Brown bears occur throughout Alaska except on islands south of Frederick Sound in Southeast Alaska, west of Unimak in the Aleutian Chain, and Bering Sea islands. The best time to watch for bears is in spring and summer during the dawn and dusk hours when they are actively searching for food. 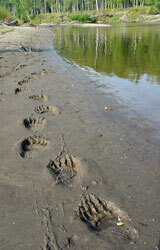 The shoreline is a common place to see bears beachcombing for dead animals, foraging on shellfish or grazing on sedges. In late July through early September, look for them at streams feeding on spawning salmon.